Sorry! This item is sold out! Made in Vermont by the outstanding craftsmen at J.K. Adams. 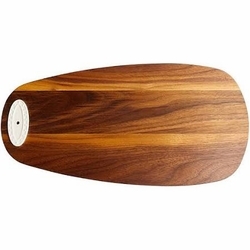 Our black walnut tasting board is as elegant as it is striking. 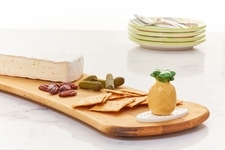 Serve your favorite cheese and charcuterie on this dazzling piece. Size: 18" x 9". Note: Do not allow wood and ceramic disk to soak in water ... wash quickly and dry immediately!